This was actually the last page that Jessica drew for Issue 1. Being the cover of our very first issue, it had to not only represent the contents of the issue, but of the entire series. 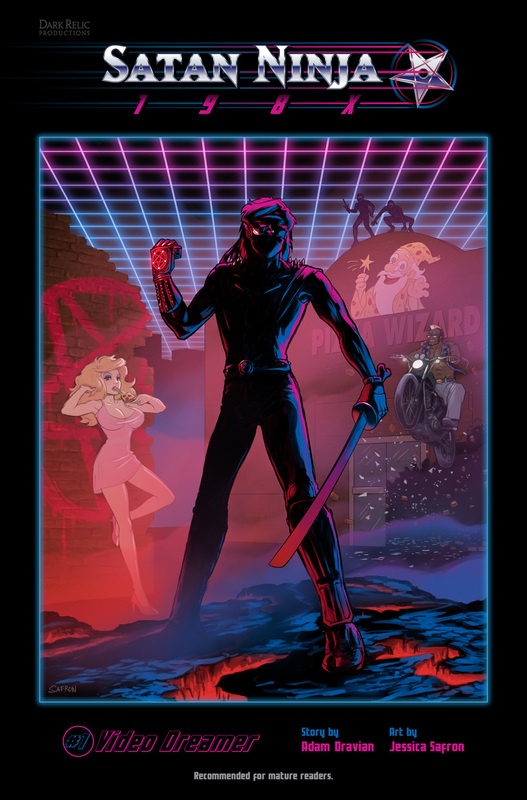 So we knew we wanted to have the titular "Satan Ninja" on display, but we didn't want to completely spoil the eventual reveal within the comic, so we kept him mostly in silhouette. At one point, we talked about having the cover of every issue be a parody of a different 80s movie poster, but we decided that was too limiting. But we do have an awesome idea for an alternate cover to Issue 1. We should have that ready for some of the conventions we'll be appearing at.